sterile environment. But so often, those big plans for a healthy and verdant fern shrivel and die along with the fronds leaving you with an eyesore that makes you feel guilty for your lack of a green thumb. Part of what leads to plant neglect comes from the plants you choose to bring into the office in the first place. Plants that will thrive indoors, in the middle of cubicle mazes, have specific qualities. Before choosing a plant, first evaluate the conditions of your office. Lighting: If your office has a window or is near one, your plant options increase and you can choose a plant that does well in full or partial sun. If not, choose a shade tolerant plant. It will get enough light from the overhead lights. Temperature:Some plants don’t do well indoors because it’s too warm or they can’t withstand the temperature fluctuations between day and nights or weekends. Look for hardy plants if the temperature varies a lot in your office. Humidity: This can affect the soil, either keeping it too moist and promoting mold or drying out the soil too quickly, leading to overwatering. When it comes time to make the choice for your office, a few plants will do better than others. Jade (crassulaovata): The bright, waxy leaves and interesting shapes add a eometric quality to your office. 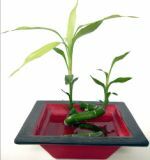 Technically asucculent, jades are vibrant green, thrive in shade and have a hardy constitution. Keep them well watered. Philodendron: These traditional indoor plants do quite well in a variety of office environments. As an added bonus, they will climb up walls — or drape down if in a basket. Plus, they can take a little neglect and still remain healthy. Peace lily (spathiphyllum): If you’re looking for a showstopper (and a plant known for cleaning the air), hoose a peace lily. These plants have large, broad, deep green leaves and will grow stunning flowers as well. They also tolerate low light. However, if you have a coworker with pollen allergies, you should clip the flower before it blooms. You can pick up these common houseplants at most home improvement stores and garden centers to transform your office today.